Enjoy a meal at the restaurant or snacks in the coffee shop/café. The aparthotel also offers room service (during limited hours). Mingle with other guests at the complimentary reception, held daily. Buffet breakfasts are available daily from 6:30 AM to 10 AM for a fee. This 4-star modern hotel, found in Dubai’s lively Bur Dubai area, is designed to be your own private apartment in the city. Every one of the hotel's accommodations has a well-equipped kitchen and comfortable seating area, great for relaxing after a day of exploring the city. 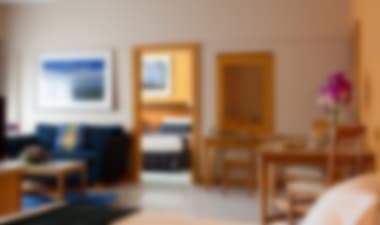 For your added convenience, complimentary wifi is provided throughout the hotel, helping you to keep connected. The 4-star Grand Excelsior Hotel – Bur Dubai is found in the heart of Bur Dubai, an ideal spot for leisure and business travellers. Close by find Jumeirah Public Beach, Dubai Museum, the WAFI Mall, the Hindu Temple and Ras al Khor Wildlife Sanctuary. Stay connected using the complimentary wi-fi accessible throughout and relax in the sauna, steam room, Jacuzzi, spa and rooftop swimming pool. All the rooms are fitted with a flatscreen LCD TV, minibar and air conditioning. 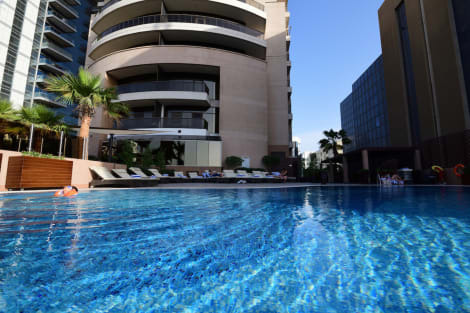 With a stay at the contemporary 4-star Majestic City Retreat Hotel, you can enjoy traditional Arabic hospitality in a central city spot, just a short stroll from the beach and with picturesque views of Burj Khalifa. Comfortable rooms have a fully stocked minibar, LCD TV and free wi-fi. Relax with a drink in the terrace bar before enjoying a meal in the award-winning Greek restaurant, Elia. Unwind in the gorgeous outdoor pool or sauna, and maintain your fitness regime in the on-site gym. From the 31st Mar 2014 a Tourism Dirham fee will be charged on all stays in Dubai hotels, this will be collected at check-out by the hotel and will be charged per bedroom, per stay. The fee amount for this hotel is 15 AED per bedroom per night. While using a third party credit card, the hotel will ask for an authorisation from the credit card owner. For any stays overlapping New Year’s Day (31st December), there is a compulsory additional Gala Dinner fee of AED 750 per adult, inclusive of flowing house beverages & AED 225 per child from 6 to 12 years old that is not included in the room rate. Savoy Suites is supremely comfortable with a choice of 100 studio rooms and 12 two bedroom suites with en-suite bathrooms. All bedrooms are meticulously designed with a sliding door that separates the living room with an extra sofa bed, ensuring total solitude. Designed to inspire, all rooms feature spacious closets with classy fixtures and a fully equipped kitchenette.